"Mars is not a dead planet -it undergoes climate changes that are even more pronounced than on Earth," according to James Head, planetary geologist, Brown University. 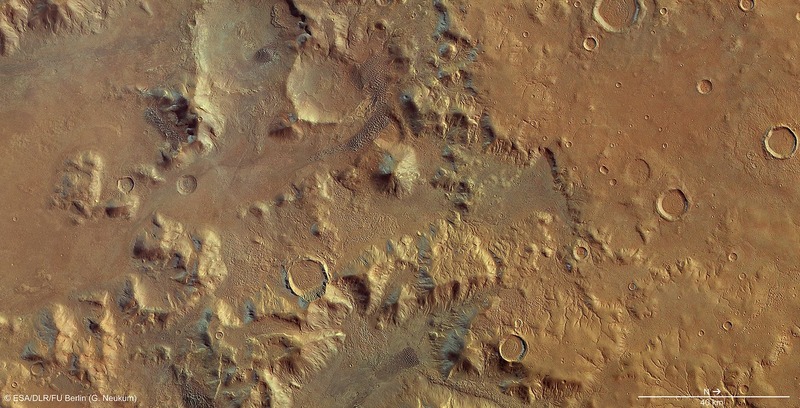 The image above was taken on 6 June 2012 by ESA’s Mars Express –combined to form a natural-color view of Nereidum Montes. 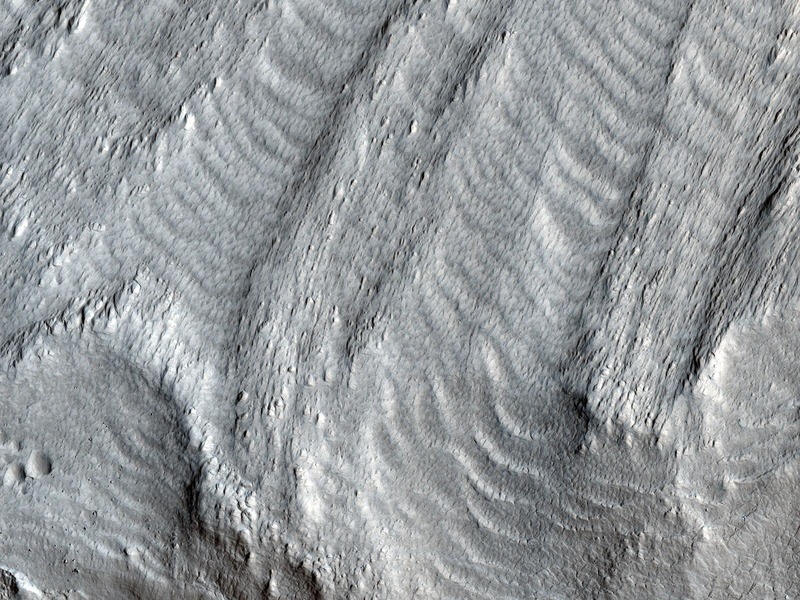 Undulations in crater floors are commonly seen in mid-latitude regions on Mars and are believed to be a result of glacial movement. This perspective view highlights many of the rippled sand dunes which form on the leeward (wind-sheltered) sides of mounds and canyons, as well as the lobate and fan-shaped surface around the impact crater which dominates the lower portion of the image. These features may indicate the previous extent of glaciation in the region, before a drier period in the planet’s history created the smooth plains. The prevailing thinking is that Mars is a planet whose active climate has been confined to the distant past. About 3.5 billion years ago, the Red Planet had extensive flowing water and then fell quiet – deadly quiet. It didn't seem the climate had changed much since. Now, recent studies by scientists at Brown University show that Mars' climate has been much more dynamic than previously believed. After examining stunning high-resolution images takenin 2008by the Reconnaissance Orbiter, researchers documented for the first time that ice packs at least 1 kilometer (0.6 miles) thick and perhaps 2.5 kilometers (1.6 miles) thick existed along Mars' mid-latitude belt as recently as 100 million years ago. In addition, the team believes other images tell them that glaciers flowed in localized areas in the last 10 to 100 million years – a blink of the eye in Mars's geological timeline. "We've gone from seeing as a dead planet for three-plus billion years to one that has been alive in recent times," said Jay Dickson, a research analyst in the Department of Geological Sciences at Brown and lead author. "[The finding] has changed our perspective from a planet that has been dry and dead to one that is icy and active." In fact, Dickson and his co-authors, James Head, and David Marchant, a associate professor at Boston University, believe the 2008 images show that has gone through multiple Ice Ages – episodes in its recent past in which the planet's mid-latitudes were covered by glaciers that disappeared with changes in the Red Planet's obliquity, which changes the climate by altering the amount of sunlight falling on different areas. NASA's Global Surveyor and Odyssey missions have provided evidence of a relatively recent ice age on Mars. In contrast to Earth's ice ages, a Martian ice age expands when the poles warm, and water vapor is transported toward lower latitudes. Martian ice ages wane when the poles cool and lock water into polar icecaps. The catalysts of ice ages on appear to be much more extreme than the comparable drivers of climate change on Earth. Variations in the planet's orbit and tilt produce remarkable changes in the distribution of water ice from Polar Regions down to latitudes equivalent to Houston or Egypt. Researchers, using NASA spacecraft data and analogies to Earth's Antarctic Dry Valleys, reported their findings in the journal Nature. "Of all the solar system planets, has the climate most like that of Earth. Both are sensitive to small changes in orbital parameters," said Head. "Now we're seeing that Mars, like Earth, is in a period between ice ages," he said. This evidence of recent activity means the Martian climate may change again and could bolster speculation about whether the Red Planet can, or did, support life. Head and his team examined global patterns of landscape shapes and near-surface water ice Nasa's orbiters mapped. They concluded a covering of water ice mixed with dust mantled the surface of to latitudes as low as 30 degrees, and is degrading and retreating. By observing the small number of impact craters in those features and by backtracking the known patterns of changes in Mars' orbit and tilt, they estimated the most recent ice age occurred just 400 thousand to 2.1 million years ago. Marchant, a glacial geologist who spent 17 field seasons in the Mars-like Antarctic Dry Valleys, said, "These extreme changes on Mars provide perspective for interpreting what we see on Earth. Landforms on that appear to be related to climate changes help us calibrate and understand similar landforms on Earth. Furthermore, the range of microenvironments in the Antarctic Dry Valleys helps us read the Mars record." According to the researchers, during a Martian ice age, polar warming drives water vapor from polar ice into the atmosphere. The water comes back to ground at lower latitudes as deposits of frost or snow mixed generously with dust. This ice-rich mantle, a few meters thick, smooths the contours of the land. It locally develops a bumpy texture at human scales, resembling the surface of a basketball, and also seen in some Antarctic icy terrains. When ice at the top of the mantling layer sublimes back into the atmosphere, it leaves behind dust, which forms an insulating layer over remaining ice. On Earth, by contrast, ice ages are periods of polar cooling. The buildup of ice sheets draws water from liquid-water oceans, which lacks. Dickson and the other researchers focused on an area called Protonilus Mensae-Coloe Fossae (below). The region is located in Mars's mid-latitude and is marked by splotches of mesas, massifs and steep-walled valleys that separate the lowlands in the north from the highlands in the south. The team looked in particular at a box canyon set in a low-lying plain. Images show the canyon has moraines – deposits of rocks that mark the limits of a glacier's advance or the path of its retreat. The rock deposit lines appear to show a glacier that flowed up the box canyon, which "physically cannot happen," Dickson said. The finding could have implications for the life-on-argument by strengthening the case for liquid water. Ice can melt two ways: by temperature or by pressure. As currently understood, the Martian climate is dominated by sublimation, the process by which solid substances are transformed directly to vapor. But ice packs can exert such strong pressure at the base to produce liquid water, which makes the thickness of past glaciers on its surface so intriguing. Dickson also looked at a lobe across the valley from the box canyon site. There, he saw a clear, semi-circular moraine that had spilled from an ancient tributary on to the surrounding plain. The lobe is superimposed on a past ice deposit and appears to be evidence of more recent glaciation. Although geologists can't date either event, the landscape appears to show at least two periods in which glaciation occurred, bolstering their theory that the Martian climate has undergone past Ice Ages.